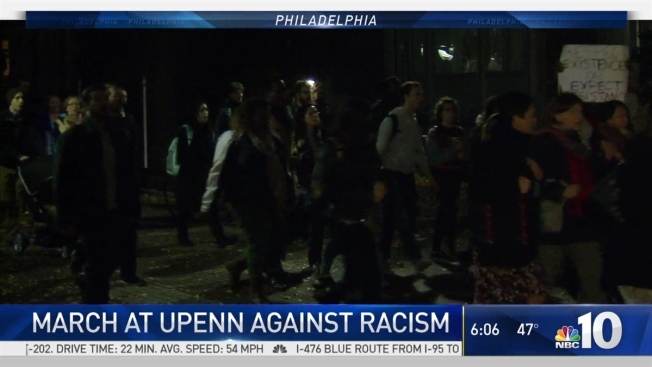 An action group urged students around the country, dressed in black, to walk out of class Thursday afternoon in response to racist messages that were sent to African-American students at the University of Pennsylvania last week. Organizers planned the #StandWithPenn walkout to take place at 2:15 p.m. ET, according to Facebook event hosted by the UPenn chapter of Black Graduate Students (BGAPSA) and Students Organizing for Unity and Liberation (SOUL). 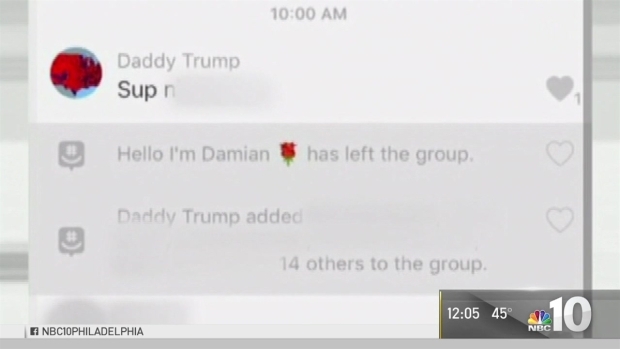 More than 100 Black students at the University of Pennsylvania were shocked when their phones were inundated with racist messages and images Friday. The university is investigating the incident that appears to have originated in the Midwest. SkyForce10 captured Penn students gathering at College Green along Walnut Street in University City -- some wearing black and carrying signs. The plan is to then have the campus' black community read a statement of solidarity. Students who can't make the initial walkout are urged by organizers to join the crowd later. "Being that the walk-out will ultimately lead to a speak-out about our different experiences regarding marginalization on our campuses, that will most likely take several hours, one can finish up their academic obligations and then come into the space later on," said organizers. "Bring your school work to the space if necessary." Authorities say that three Oklahoma residents are linked to racist messages sent to African American students at University of Pennsylvania. NBC10’s Lauren Mayk has Monday’s developments. The university said its police and cybersecurity departments determined the origin of the GroupMe account to be based in Oklahoma. Officials say an investigation revealed three Oklahoma residents, including a University of Oklahoma student, were linked to racist messages that were sent to African American students at the University of Pennsylvania. "I just felt uncomfortable," said freshman Nate Morris, one of the students who received the messages. "What was said was 'We're going to find and hunt down all African-Americans at this college." Sunday afternoon, the University of Pennsylvania announced the criminal investigation had concluded and that three Oklahoma residents, including the University of Oklahoma student, were linked to the messages. 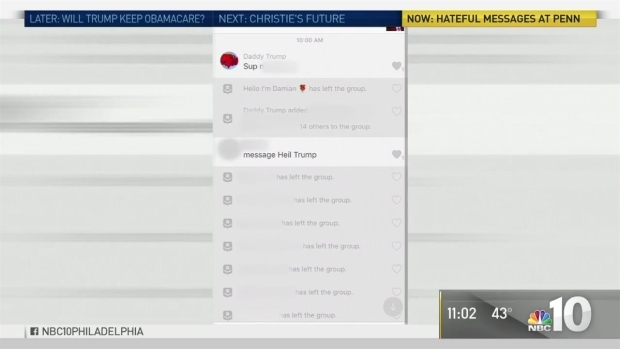 They also said no students at Penn were involved in the messages. Students posted on social media about the fear and sadness that they felt upon reading the texts. The Penn College Republicans called the incident "absolutely despicable" while university President Amy Gutmann called the messages "simply deplorable." There has been a rash of hate speech and rhetoric across the country in the wake of the presidential election, according to the Southern Poverty Law Center, which tracks hate crimes.